If you’ve ever played on a seesaw with a small child, you know that you have to sit very close to the balance point (fulcrum) if you want to counterbalance the child. This is because you are much heavier than the child. A seesaw is a simple example of a concept known as center of mass. The center of mass of a set of objects is a kind of average where the more mass you have, the closer the center of mass is to you. In the simple case of an adult and child on a seesaw, when the adult counters the child by being closer to the fulcrum, that means the center of mass of the adult and child is at the fulcrum. The center of mass of any collection of objects (like the solar system) is fairly easy to calculate if you know the masses and positions of everything, and it is very useful because the center of mass of a system is only affected by forces outside the center of mass. Take for example the solar system. The sun, planets and asteroids as a whole have a center of mass. The gravitational forces of all these things interact with each other and affect their motions relative to each other, but none of them change the location of the solar system’s center of mass. The motion of center of mass is only affected by things outside the solar system, for example all the other stars in the galaxy. This is important to keep in mind if you want to visualize the “true” motion of the sun and planets through the universe. For one thing, there is no absolute frame of reference, so you always have to talk about motion relative to something. So it would be accurate to talk about the motion of the sun and planets relative to the center of the galaxy, the cosmic microwave background, or the star Vega. Each of these are different vantage points, and each of them are equally valid. With center of mass we can simplify things in talking about motion. Yes, the solar system is orbiting the galaxy about once every 240 million years, but that is the motion of the solar system’s center of mass relative to the galaxy. If we’re just concerned about the motion of the planets relative to each other, we don’t have to worry about that. Instead we can look at the motion of the sun and planets relative to the center of mass of the solar system. The Sun makes up about 99.8% of the total mass of the solar system. This means the center of mass of the solar system is very close to the center of the Sun. It is so close that the center of mass is actually located in the Sun, just not at its exact center. And because the planets move over time, the center of mass moves as well. 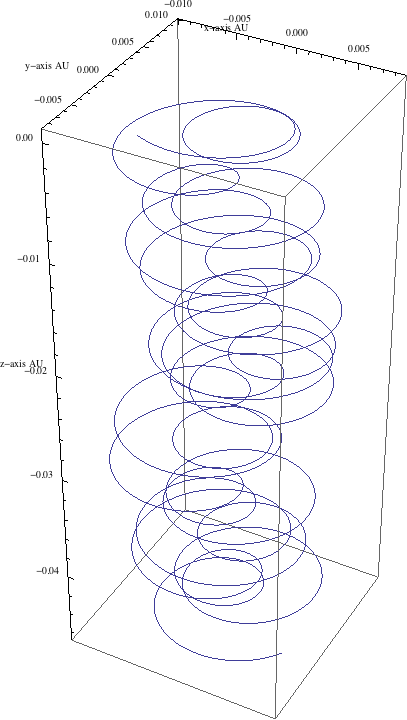 In the figure below, I’ve made a few plots of the motion of the center of the Sun relative to the solar system’s center of mass. I’ve calculated the motion of the planets over a period of 300 years, then calculated the Sun’s position relative to the center of mass. In the first image you can see how the Sun’s position wobbles over time. In the second you can see a history of the Sun’s motion over 300 years. This motion is actually quite small. The border of the second image is roughly twice the width of the Sun, so you can see that the Sun wobbles only about its width at most. This is why we often just ignore this wobble and talk about the planets orbiting the Sun. They actually orbit the center of mass, but that isn’t a huge difference. This wobble is, however, very real. We have observed similar wobbling motion in other stars, which is one way to tell that a star has planets. 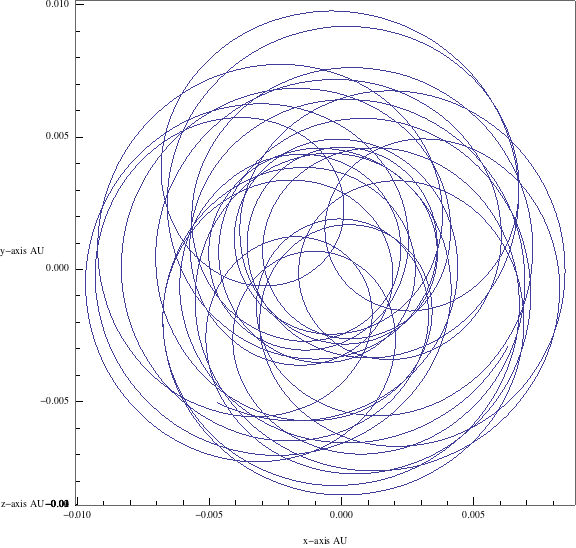 We can even determine the mass and orbits of these planets by the wobble of a star. Despite all this complication, the idea that the planets and asteroids orbit the Sun in simple ellipses is pretty accurate. You only need to account for the wobbles and center of mass if you want to make highly accurate calculations.